Interested candidates, can Apply Online For 22 Dental Hygienist, Consultant Posts. But before that check the official WBSHFWS Recruitment 2019 Notification. Total requirement details are clearly Instructed. Apparently, by the midnight of 18th January 2019, all the interested and eligible, candidates, have to submit the application form. After that, the Online Application Link will be deactivated. Now, if you are not eligible, or if you are not interested in this opportunity, you can always check more other West Bengal Latest Govt Jobs, by following our site Freshers Now, regularly. Well, the officials of the West Bengal Health & Family Welfare Samithi are looking for the Candidates, who completed their 10+2, Diploma and Law Degree as the Educational Qualification. Starting from 7th January 2019, all the interested candidates can start submitting their WBSHFWS Online Application form 2019, for the available 22 Dental Hygienist, Consultant Posts. Surely, this is a great chance for the people, who are looking for the Government Jobs in the West Bengal State. Obviously, the Job location for the hired candidates will be across the state. And the officials of the West Bengal Health & Family Welfare Samithi, are even paying a good salary. So, make use of this chance. 22 years to 40 years. Rs.100/- for the people, of General Category and Rs.50/- for Reserved Category people. You will find the Recruitment Table, filled with different Notifications. Go through the Requirements clearly. WBSHFWS Recruitment 2019, is surely a great chance for all the Job searchers in the West Bengal State. So, share this latest news with all your fellow job searchers. WBSHFWS Recruitment 2018 Notification for total 29 Audiometric Assistant, Instructor, Audiologist Vacancies are announced on 22nd November 2018. And the officials of the West Bengal Health & Family Welfare Samithi are accepting the applications from 28th November 2018. Also, the deadline to submit your Application form is 21st December 2018. After the closing date, the officials are not going to accept the applications. So, go on and check the total details. And then proceed to apply, for the WBSHFWS Recruitment 2018 before the final date. Remember having all the qualifications correctly, is very important. Here is an amazing chance for the people, who are searching for the Government Jobs in West Bengal State. Go on and check all the details. And then proceed to apply for the WBSHFWS Recruitment 2018 before the closing date. And if you are not eligible or if you are not having all the Qualifications correctly, you can go ahead and check more other Latest Government Job Notifications on our site Freshersnow.com regularly. Well, the officials are accepting the application in the Online Mode. So, the candidates who are having all the Qualifications can go ahead and submit the application form in the official site of the organization. The Complete process is clearly given at the end of this post. Applicants need to have the correct educational Qualification, at the time of applying. As per the details in the notification, aspirants need to complete their Bachelors or Diploma or B.Ed, D.Ed in the Respective fields from any recognized institute or University. Merit List basing on the Education and Work Experience. Over there you will find the WBSHFWS Recruitment 2018 Notification for 29 Audiometric Assistant, Instructor and other Vacancies. Fill it and submit it before the closing date. WBSHFWS Recruitment 2018 Notification is a great chance for the people, who are looking for the Government Jobs. Use it. ave you been searching for WBSHFWS Recruitment 2018-2019 Notification? Then you have landed on the exact platform. Interested aspirants can Apply for 79 Dental Surgeon, Dental Hygienist Vacancies as soon as possible. Recently the authority of West Bengal Health & Family Welfare Samithi has released 79 Vacancies for the posts of Dental Surgeon and Dental Hygienist. Moreover, in the below sections we have furnished the detailed information regarding Application Fee, Educational Qualification, Age details, Age Relaxation, Pay Scale, Selection Procedure, Online Application link, Official WBSHFWS Recruitment 2018-2019 Notification. Therefore, at last, we have given the Official WBSHFWS Recruitment 2018-2019 Notification. So, we recommend all the aspirants should apply through Online Mode. Furthermore, aspirants stay tuned this current article for the latest updates regarding WBSHFWS Recruitment 2018-2019 Notification. Candidates should mainly know about the Starting and Closing date of the applications. According to the Official Notification can start applying for the WBSHFWS Recruitment 2018-2019 Notification from 27th March 2018. And the deadline to submit the application for WBSHFWS Recruitment 2018-2019 Notification is 8th April 2018. The authority of WBSHFWS is intimating the willing people to apply on or before the closing date. Moreover, there is a lot of time for applying, but we suggest all the contenders make necessary preparations and apply for the interested vacancies. Furthermore, applicants must and should apply through Online Mode. Moreover, this is the right time for WBSHFWS Recruitment 2018-2019 Notification. Aspirants before applying should verify the Official Notification carefully. Furthermore, we have attached the official Notification link at the end of this post. Also, remember that the incomplete applications will strictly reject by the authority of WBSHFWS. We have collected all the mandatory details regarding WBSHFWS Recruitment 2018-2019 Notification and clutched in this article. Interested aspirants take a brief eye at this article.Moreover, candidates can verify the specific information such as Name of the Organisation, Name of the post, Starting date of Application, and Closing date of the Application, Mode of the Application, Official Website. And also aspirants can know the vacancies released by the authority. Moreover, the authority of West Bengal Health & Family Welfare Samithi has released 79 vacancies for Dental Hygienist and Dental Surgeon posts. Therefore interested candidates can know the necessary details, by scrolling down this post. Moreover, stick to this article for the latest updates. Therefore bookmark our web portal to receive the notifications. Moreover, the most importing thing is all you have to do is to verify the Eligibility criteria in all aspects. First and foremost point is to verify the Educational Qualification. For Dental Surgeon post candidates should possess BDS from an authorized institution. And for Dental Hygienist aspirants should possess 12th pass and Diploma in Dental Hygienist course from an approved institution. And next to the Educational Qualification the essential aspect is the Age details. According to the Official Notification, the Maximum age is 40 years, and the Minimum age is 22 years. Moreover, the Age Relaxation will be given to the some of the categories. Furthermore, the Application Fee for the General Category is Rs. 100/- and for the Reserved Category the Application Fee is RS. 50/-. Therefore candidates stay tuned to the current article for more latest updates. Moreover, coming to the Selection Procedure the selection of the aspirants is purely based on the Academic Marks, Experience, and the Interview. Moreover, we recommend all the candidates to make necessary preparation before attending the Interview. All the interested aspirants should take the documents required for the interview. Otherwise, you will be strictly rejected by the authority. The PayScale for Dental Surgeon is Rs:35000/- per month. And for the Dental Hygienist, the Payscale is Rs:15000/- per month. Depending upon the performance the officials will increase the Payband. Moreover, coming to the vacancy details the vacancies for the post of Dental Surgeon is 50 vacancies. And the vacancies for the position of Dental Hygienist is 20 vacancies. For more queries visit the official web portal of WBSHFWS at www.wbhealth.gov.in. Dental Hygienist: The aspirants should possess 12Th pass and Diploma in Dental Hygienist course in an approved institution. The Age Relaxation will be applicable for some of the categories. Moreover, aspirants should face three rounds. Therefore, after the completion of the registration process aspirants should focus on the selection rounds. 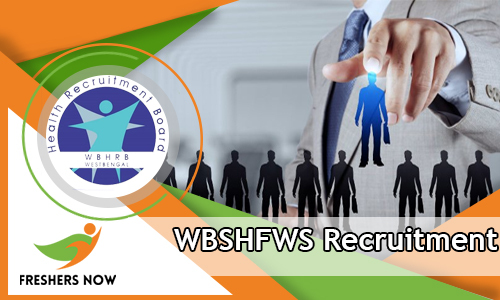 Moreover, a massive number of the candidates are asking to provide the stepwise procedure to apply for the WBSHFWS Recruitment 2018-2019 Notification. For the sake of the aspirants, we are bundling the stepwise process in the below sections. Refer the whole article thoroughly. First, click on the Official web portal of West Bengal Health & Family Welfare Samithi at www.wbhealth.gov.in. We hope all the aspirants got enough information regarding WBSHFWS Recruitment 2018-2019 Notification. Moreover, aspirants if you have a query then leave a message in the comment section. We will clarify your doubt very soon. Moreover to know the latest stuff keep browsing Freshersnow.com regularly.